Our photo backup service is part of the Photomyne subscription account membership. Here’s more information on photo backup. How does Photomyne’s account backup work? 1. 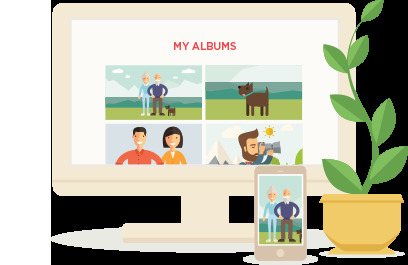 Unlimited photo backup of your photos: Every single photo you create and save with the app, along with it’s original scan and annotated details, will be saved on our cloud. While storage services such as Google Drive and Dropbox offer cloud backup, Photomyne’s backup is unique: It’s the only one that saves not just the scanned photos but also the original shots you took, along with all the details and descriptions you added to each photo or album (applies to when you restore photos after logging out and back in, or after switching to a new device). Save the story behind the photos! This way we’ll have a secure (and private) copy on our servers for easy photo restore whenever you need it. 2. Access photos from any device: By default, your Photomyne photos are kept within the photo scanner app, on the device you used to scan them. The cloud backup feature makes it possible to access your account on other devices — one account, multiple devices. This includes accessing your photos on the photomyne.com website online, right from your desktop computer! 3. Free up space on your device with our cloud-only backup option: If you have scanned lots of photos with the app, and their accumulated size starts eating up your device’s memory, you can activate the cloud-only backup option. This special feature reduces the overall storage space the app and its photos take up on your device. Here’s more information on the Cloud-only photo backup option. As long as you’re an active Photomyne subscription member, you will enjoy all the benefits listed above. How to back up your photos? In order to enjoy backup, all you need to do is join Photomyne by subscribing (and thus activating your account). This includes signing up and proceeding with the subscription purchase. 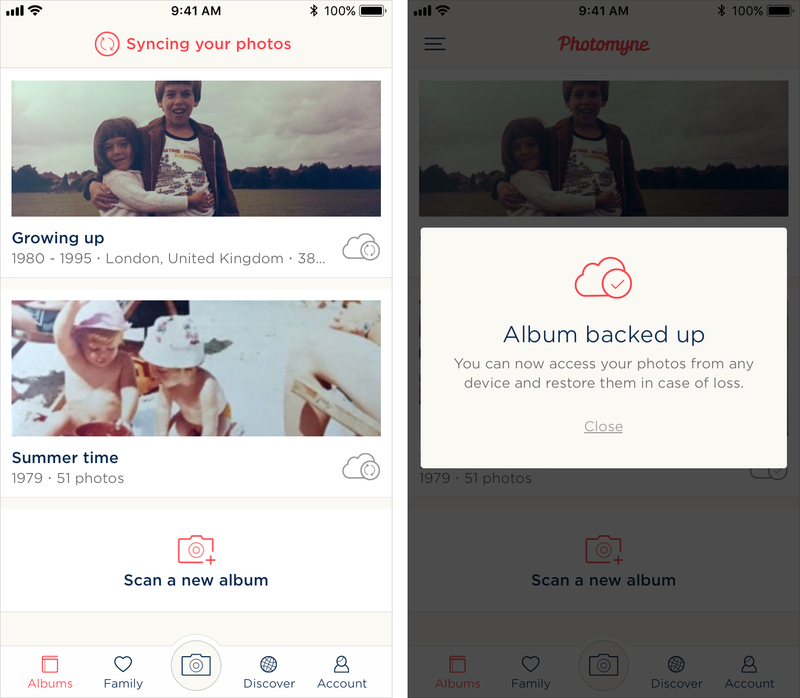 Once signed up, photo backup will start automatically (you’ll see the cloud & revolving sync icon on your album covers while this is happening). While backup is in progress please make sure the app stays open until it is complete. What it looks like while the app is backing up your photos. Please keep the app open until backup is complete. Who can see your backup photos? Where are photos actually stored? The photos are saved and stored on servers owned and hosted by Amazon Web Services, Inc., a subsidiary of Amazon.com. How to view backed-up photos? Once backup process is complete your scanned photos are synced to the cloud. From that point on you can view the photos using Photomyne’s photo scanner app on your next login, and online by going to photomyne.com and logging in with your username and password. Please note: photos are synced from the app to the cloud (server). This means that if you delete photos from the app their backup copy will also be deleted.